RFID Hotel locks. High-security electronic locks. 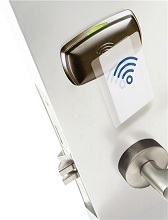 RFID technology provides state-of-the-art electronic locks that offer maximum security and great ease of use that can be tailored to match the style of any hotel. Allure by VingCard is a pioneer RFID lock solution with impressive design, offering more functionalities than any other electronic locking system, and comprehensively effectuating modern trends to downsize interior door locking systems. Allure is a flexible hardware and software combination effectuating substantially the “invisible lock” concept, by eliminating all external material from doors through use of a futuristic touch panel in the interior, allowing guests to display “Do Not Disturb” and “Make Up Room” notifications addressed to the hotel staff by means of a LED indication displayed on the exterior. An elegant external display easily installed on the wall adjacent to the door and comprising a touch-activated door bell, displays the hotel logo and the room number and notifies guests when the door is open. The system is designed to be used either as part of a VingCard RFID locking system or merely as a DND/MUR panel, where a locking system is already in place. Allure is fully compatible also with VISIONLINE, a patented VingCard solution discharging the hotel staff from the task of re-programming personal lockers on-site or changing batteries. It also enables guests to make room changes or extend their stay without a need o visit the reception. The new Essence by VingCard is a true revolution in electronic locking, as it combines the features of traditional electronic locks, including readers both in the door’s interior and exterior, with minimal design. The new VingCard lock is compatible with ISO 14.443A (MIFARE), ISO 14.443B and ISO 15.693 standards and Near Field Communication (NFC) standards, as well as with a broad range of RFID providers, anti-cloning and RF-online technologies and wireless Internet connection interfaces. Signature locks are designed to ensure maximum security for hotels while retaining classic, timeless design features. Signature locks are the best choice for hotels that prefer discrete locks that blend in harmoniously with the entire interior, while also offering an extensive choice of both designs and options. Reflecting the current trends in technology, Signature locks allow hoteliers to choose from cutting edge electronic locks such as the Signature Radio Frequency Identification (RFID) lock range that offers maximum security with easy-to-use functionality, since guests do not have to insert the card into a reader built into the lock, but simply swipe it over the reader. Thanks to the built-in memory, cards can be safely reprogrammed for future use and can record all entry and exit data relating to the use of any specific lock. It is also possible for mobile phones with RFID compatible technology to open room doors. It upgrades all mechanical cylinder locks into Electronic ones, easily and quickly, with a minimum cost! All you need to do is simply replace the old lock cylinder with the electronic Vingcard Elsafe cylinder. An E-cylinder will in principle replace a mechanical cylinder and control/operate a mechanical lock case the same way. Access control in sliding, narrow profile doors, etc. Visionline is much more than just a simple electronic lock. It is a wireless access control system that operates with stand-alone, cable free electronic locks, with direct RF-online connectivity based on the Zigbee high security open platform. Visionline offers numerous functions that generate significant benefits for any property. VingCard-Elsafe’s Visionline System can also be combined with Signature RFID locks. Electronic locks with a magnetic mechanism are the most cost-effective solution from VingCard-Elsafe but lack nothing in looks and the security they provide. Alfa locks are VingCard-Elsafe’s most cost-effective solution, but lack nothing when it comes to looks and security. 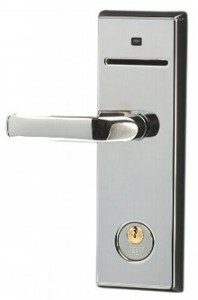 Classic locks have established VingCard-Elsafe worldwide as synonymous with room safety. Their elegant design coupled with the wide range of available styles and detailing, ensure that Classic locks blend in beautifully to the overall style of the hotel as well as the room interiors. The real-time technology built into the locks ensures that when the card is inserted by any new guest, it prevents access by all previous guests. At the same time, a special memory chip records the total number of times the card is used by a guest during his/her stay, offering total security and reliability. Signature locks are the most elegant solution and blend perfectly with the rest of your hotel environment regardless of style. These locks have been designed to take into consideration human needs thus they come in ergonomic shapes to make them as easy as possible for users to operate. Signature locks offer various décor options and can be matched to more classic interiors or more trendy ones with a modern style. VingCard-Εlsafe’s VISIONLINE can be combined with Signature magnetic locks. Vingcard- Εlsafe’s card management system is safe, user-friendly and easily tailored to each hotel’s access control requirements.